Turre water contaminated AGAIN – don’t drink it! Sulphates in the water? Well, it’s probably just the health department being over cautious. But when the Health Department reckons the water could make you ill, I’d have thought that a little more notice could be given. 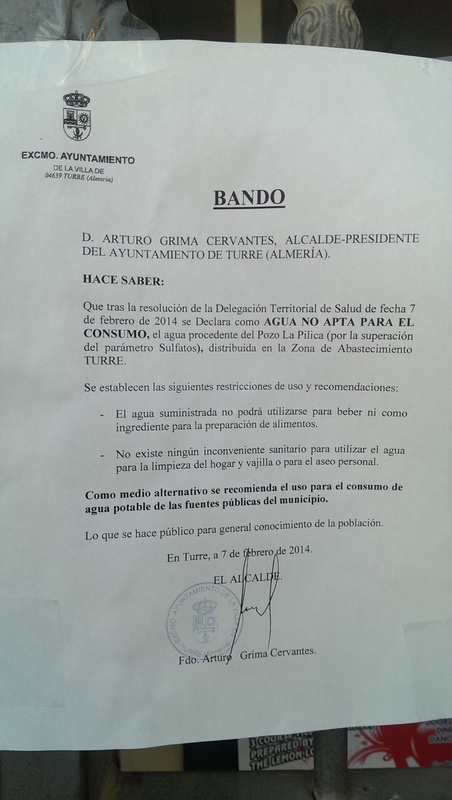 The Turre townhall, with its usual blasé attitude towards public health and safety, has quietly stuck up a notice in Super Turre telling people that Turre water is contaminated and condemned by the Health Department. The Bando (official notice) says that the reservoir at La Pilica which supplies water to Turre was found to be contaminated with sulphates on the 7th of Feb, and so the Health Department has warned it is not to be drunk, ingested or used for the preparations of food. Don’t stop them from charging us through the nose for it, though. Turre water can still be used for cleaning or personal hygiene. The public fountains are supposedly OK, but I wouldn’t trust them. I haven’t seen this information anywhere else, so it seems that as usual when the water supply breaks, Turre townhall just tries to hide the fact until the levels naturally go down again. 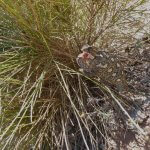 This entry was posted in Blog and tagged fresh water, super turre, turre, water by David. Bookmark the permalink. i am browsing this web site dailly and take nice facts from here every day. Next → Next post: IPTV – Will Telefonica shut me off if I start watching UK TV over the net?